Longtime Palm OS ROM hacker Shadowmite has posted what appears to be one of the first shots of an Treo 800 / Palm Zeppelin prototype device. The picture matches up with most of the earlier leaked renderings and presents a clear view of the long awaited new Palm smartphone. Unfortunately there are no major new details or confirmation of existing rumored specs along with the picture. The little tidbit the source does confirm is that the device uses a new micro USB connector. Read on for the full sized pic. * Updated with side view. Update: The Treo 800w has been released on Sprint. You can read our first impressions review here. 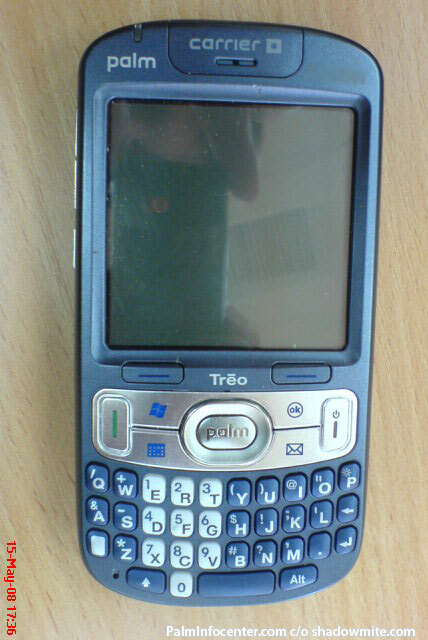 While official specs have been very slow to emerge, the general consensus among the rumors that have surfaced say that the Treo 800w will be powered by Windows Mobile 6.1 Professional, have a 320x320 recessed touchscreen, a ~400mhz CPU and 128mb of RAM with 256mb of ROM. It should also achieve a series of notable milestones, such as Palm's first EVDO REV-A handset, Palm's only GPS-enabled device, and Palm's first smartphone with integrated wi-fi capabilities. Bluetooth 2.0 with A2DP and a 2.0megapixel camera round out the hardware specs. Not the most exciting looking phone, but I guess the feature list will help. What's up with those 2 buttons on the side of the treo logo? They are for the WM soft keys. While having the soft keys close to the actual on screen soft keys may seem like a good idea, this design would lead to more thumb travel than necessary. The two buttons are the redundant windows mobile softkeys. I had expected the screen to be more flush with the device myself given that was pointed out in the Palm Drucker slide leak. Perhaps that is indeed a separate device after all. Judging from the pic the width looks about the same as a 750/755p due to the keyboard size, but the real question is how thin or thick the device remains. Drucker is the GSM version. 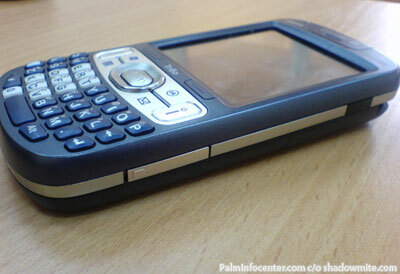 It would be the 750 to Palm's 700wx, ie an updated design. I expect the CDMA version of the 800w to be SLIGHTLY chunkier and with a somewhat stodgier design, what with the recessed screen and all. It'll also possibly be a touch cheaper and/or more heavily subsidized. However, I wouldn't go so far as to call it the 750 to the 700w/wx, though. More like the Palm III to the Palm Pilot. Same basic size, just slightly sleeker and more modern looking. I do not expect there to be any performance hardware differences (screen, RAM etc) between the two other than the casing, flush LCD, and GSM vs. CDMA radios. Of course, knowing Sprint & Verizon, the GPS and/or wi-fi of the CDMA version might be crippled in some capacity. Since we're in a speculative mood, I figure on the IR port being jettisoned alongside the Athena connector. I also would LOVE to see the 2.5mm headset jack replaced by a 3.5mm stereo headphone jack but, knowing Palm, they'll probably just go entirely Bluetooth. We might as well get used to this formfactor, as I recknon the first Nova device to use this exact FF or a slightly modified version of it. It's the Zire 71 phone I think. C'Mon Baby. I Give Up! RE: C'Mon Baby. I Give Up! Actually, it looks more likely that its someone from Palm PR wearing a sundress. Looking at the picture closely, you can see ceiling A/C vents and those square tiles that every office uses for ceilings. Note to self - start looking for reflections of Nova prototypes in screen reflections from leaked product pics. You don't think PALM would PURPOSEFULLY leak this, do ya!? >>>You don't think PALM would PURPOSEFULLY leak this, do ya!? "Pleez. Sum1 help uz. Colligan iz crazee!" This coming from the ipod father. All I can say is zzzzzzzzzzzzzzzzzzzzzzzzzzzzzzzzz! Nah - he showed up in August or so. Though there doesn't appear to be anything excitingly new in this device, the lead time requirements STILL are more than the time he's been with PALM. 'V' for Verizon? Vodafone? Victory? If it came with PalmOS I would buy one on the 1st day it is available. No way am I going to WM. I would rather wait for an Android-based phone. Even if it came with PalmOS, I'd be waiting on the Android models and hoping for a tablet version. I don't like those thumbboards. Nosiree. Give me graffiti & a stylus any day. I suspect that folks who think like me represent such a small portion of the marketplace that this opinion will have no weight at all with PDA and Smartphone developers. Well, I´m with you on the thumboard thing, I do think it will be nicer to have a grafitti -1 of course!- enabled treo or centro than those hard little keys! One of the best programs I ever put on my Palm is Jot. If you have Jot on your phone, you can use the stylus to write Graffiti (and you can use G1 characters). Someone correct me if I am wrong, but won't this be the only CDMA WinMob 6.1 Pro phone with a QWERTY keyboard, 320x320 LCD, wi-fi, and integrated GPS? Not to mention Rev.A. The CDMA version of the 800w might be able to get by on specs, formfactor & price....especially with weaker competition in the Sprint/Verizon/Alltel world (at least for the first 3-4 months until the new BBs start to arrive). GSM is gonna be another story. Palm MUST come in high style or be super-aggressive on pricing. Here's hoping for the 800w GSM/Drucker (I wouldn't be surprised if they call it the Treo 850, actually) to be along the lines of the recent slew of monolithic, shiny, fingerprint-prone black slab-esque handsets being releaed or heading to market. Not really my cup of tea personally, but it appears that's what the market wants to see nowadays. P.S. I haven't been keeping up.....anyone know if WM 6.1 Pro still supports "block character" input a.k.a. Classic Graffiti 1? Wouldn't that be just tragic? To have to buy a WM-powered smartphone just to get the G1 functionality offered by classic Palm OS PDAs! Is the world waiting for this? I don't understand this phone at all. Unless it has a Centro-like price, who would want it? Other WM phones have better features. This is a We've Finally Caught Up device. Even if they expect Palm WM to buy it as an upgrade, I think those customers are already looking at other phones. RE: Is the world waiting for this? I can see lots of Palm first's on this product, but those features are already available on the market for a long while already. Palm is really too late in bringing products to the market. > ...So, is this FAIL? They probably don't even start building them without some sort of carrier commitment. Given pricing elsewhere (e.g., the Blackberry Bold getting priced out at $200-ish), PALM's margins might take ANOTHER hit, but they probably have sold a few already. But it WOULD be interesting if they pulled a Fooleo on us, huh? Looks thinner than the 755 / 680. Thanks for pointing that out Pat. I updated the article with the new side shot. Looks like a frikkin CENTRO from the side. Is that what they're doing now, using the Centro as the new template? I guess that will help make batteries cheaper. In what year are the Palm people living? Haven't they look at the phones the competition is producing... iPhone, Curve, Bold, even those Motorola bricks look sexier than this dull design. Palm has been producing the same type of phones for so many years that is actually difficult to tell each of them apart. RE: This phone is UGLY! Hands-on Video Review of the Treo 800w!!! RE: Hands-on Video Review of the Treo 800w!!! Rumors? Crap. Time for Palm to 'leak' a 'specs page'. As far as I have been able to tell, the rumors are getting constant reinforcement from one source, Mal-something-or-other on TreoCentral, without any reason other than desire. He was just asked "Where did THAT rumor come from?" (wifi or wifi button location) and he completely sloughed it off. Be REAL Careful Out There! WAY too many Me-Too Media folks have NO PROBLEM pulling "facts" out of the air completely without reality to back them up, then stating them as unambiguous facts until someone comes back at them and says "WAITAMINUTE!". And then the OTHER Me-Too Media folks QUOTE them! (which is, of course, why they're labeled "Me-Too Media"...). At least we're back to blurry photos - MUCH more realistic! BTW - I think it's way interesting that no photos show the device turned on. They're all coming from the same source/location IMO. OR they could be non-functional dummy models/shells/mockups. More curious is that we haven't seen the back panel, left side, top or bottom of the device. It's like they are intentionally trying to cover up some missing/still-present feature--but what could it be--Athena connector instead of microUSB, 3.5mm headphone jack, no wi-fi switch, no ring/vibrate switch???? P.S. I'm glad to see IR still in there. Sure, most people don't use it but it doesn't bring any drawbacks to the table with its inclusion and it's THERE if you DO want to use/need it (IR sync to an old laptop, use as a TV remote control etc). And the 800w's memory card door looks to be considerably easier to access than the Centro's. Notice that the new comparison shot shows all sprint phones! Also looks like the 800w is somewhere in the ~.6" range for thickness. The upstage above it is .37, while the PPC-6800 is .7" inches. Is 'ready' the same as 'done'? == at the end of the calendar year?" == new OS, I said it would be ready."